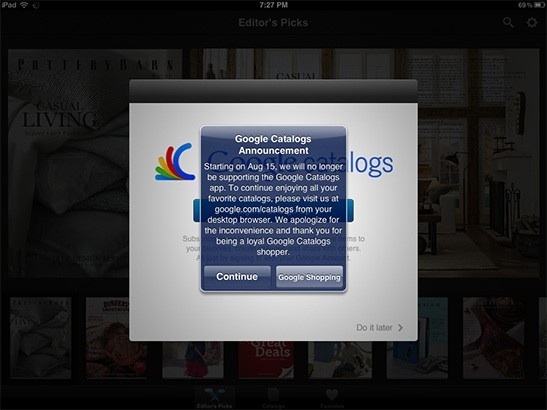 As highlighted by Android Police and Engadget, Google is ending support for Google Catalogs, its product browsing app for iOS and Android, on August 15. The app originally launched first on the iPad in 2011 and collaborated with various apparel merchants in an attempt to bring users rich, interactive content. The news comes just days after Google removed the Google+ Local App from the App Store following integration into Google Maps last week. Google also ended support for Google Reader, its RSS service, earlier this month. This is why I've been trying to switch from Google products to others. Too many times Google decides to drop products all of a sudden. Prime examples are Gmail Exchange capability and Google Reader. What the hell is Google Catalogs? You just better hope that those others don't end them too. If those others are Apple, then you obviously forgot about MobileMe, iDisk, etc. Technology is unsuccessful, or outdated, or just uneconomic to maintain in the face of competition. It goes away. Life moves on. Crap, I actually used and liked Google Catalogs on my iPad. Google kills a service and it's was "just a test product". Apple fails at Ping and it's stock falls 100 points. This is one of biggest irritations about the perceptions of the two companies. One difference is that Google usually doesn't have their CEO spend ten minutes on stage, telling everyone how incredibly magical (fill in the blank) is, and how it'll change your life forever. When you do that, people have different expectations. Another prime example of how google just throws stuff at the wall and prays it sticks. It's like google is a teenage girl with commitment issues. Add this to the pile with other Google products like Wave, Reader, Dodgeball, and Buzz. They seem to be dropping anything that they cant monetize easily, or cant be bothered to maintain anymore. Thankfully anything part of the enterprise market is safe (i.e Calendar, Gmail, Contacts, Talk, etc). In fairness, Google does run a hell of a lot more 'beta' products than Apple, and has always done so. They like to try things out. I guess most of the projects they try out come from acquisitions and the 20% personal project system they have.